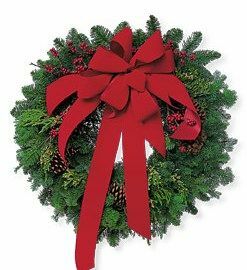 This Friday is Poinsettia Day, which means this week is a great time to get into the Christmas spirit and pick up a poinsettia plant, wreath, and more from our Atlanta flower shop locations. 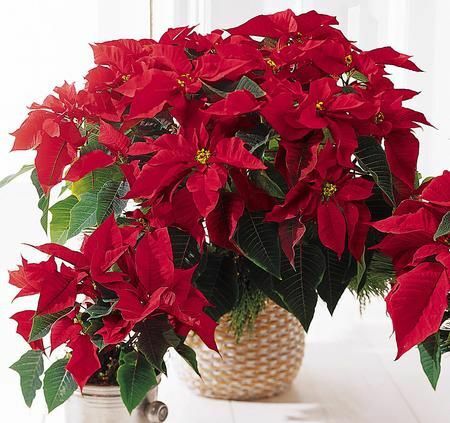 Poinsettia Day takes occurs each year on December 12th. The poinsettia is a culturally important plant species of the diverse spurge family that is indigenous to Mexico and Central America. It is well known for its red (and sometimes white) and green foliage and is widely used in Christmas floral displays. 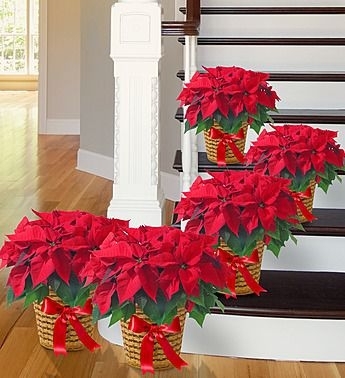 We have a wide array of ideas for decorating with poinsettias, including traditional arrangements and unique garden arrangements. 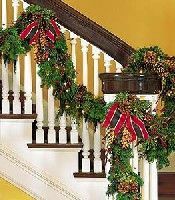 Plus, we also have other holiday decorations, including wreaths and garlands. Our Christmas Poinsettias feature 50% more blooms so you deliver a gift of amazing color as well as enjoy them for yourself. We offer three sizes that offer from 6 blooms all the way up to 15 blooms. We also have the Imperial Poinsettia has over 20 blooms and is dressed in a holiday basket with all the trimmings. Our Greenhouse Poinsettias have been featured in ‘The Southern Living Showcase House’ –and offer 30% more flowers. You can select a custom size with an array of different blooms. 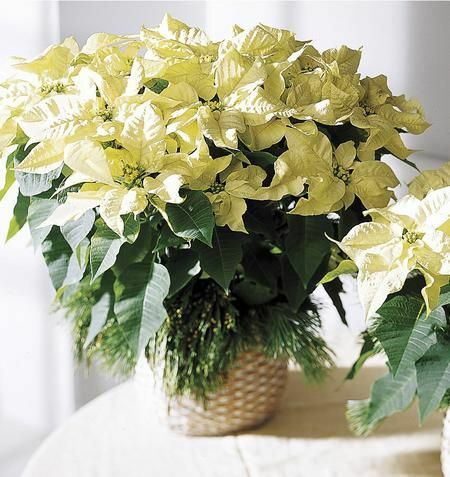 The white color offers a unique alternative to the traditional red poinsettia plant. Two holiday favorites are combined into one festive gift delivery. 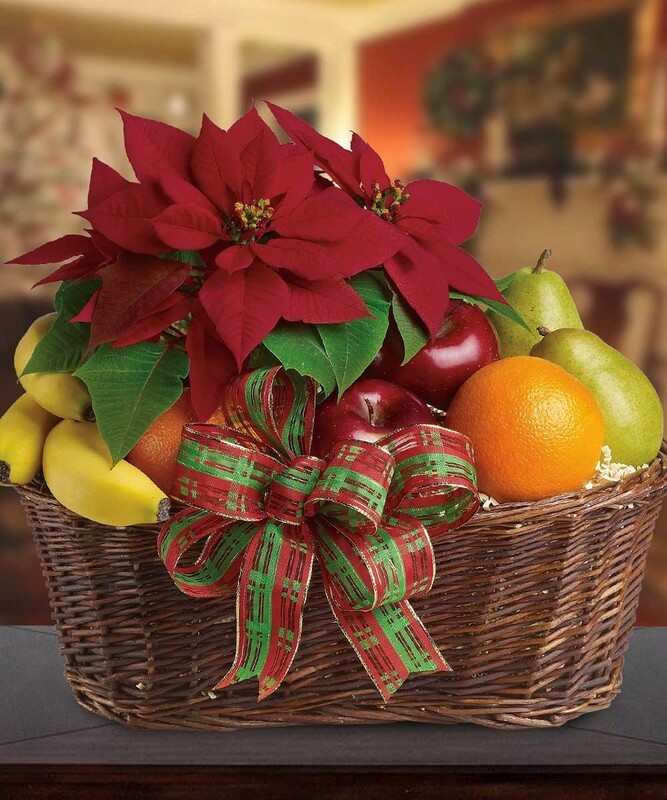 This basket includes a gorgeous blooming poinsettia plant and a delicious gift basket of holiday fruits to enjoy. This makes a wonderful gift for colleagues, clients, and, of course, loved ones over the holiday season. For the green thumb enthusiast, this is a wonderful option. 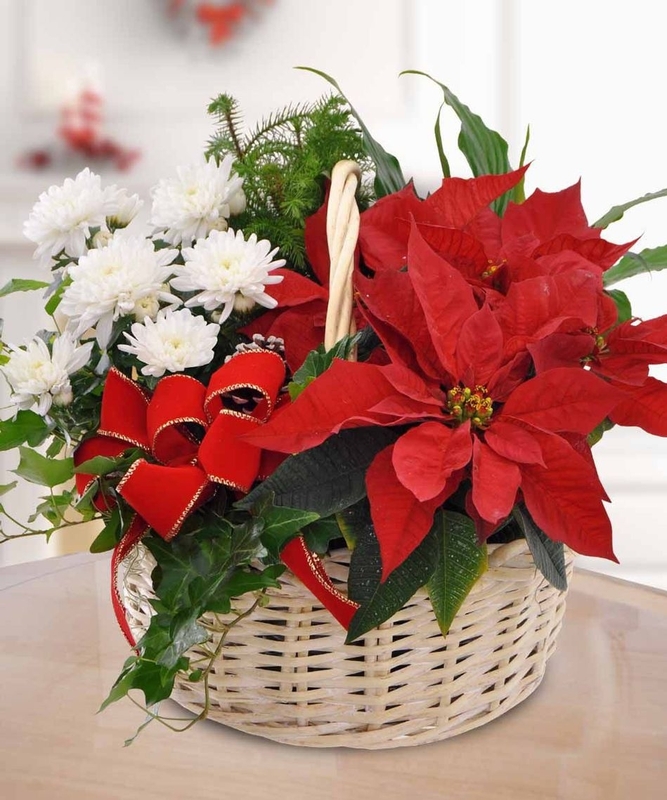 This is a garden basket that has been filled with a lovely poinsettia and other garden plants that they will enjoy throughout the holidays and into the New Year. This festive garden features a poinsettia, green and blooming plants, berries and pine cones. This is the perfect holiday gift that will be sure to last long after Christmas is over. This lovely basket is filled with winter flowers, including diffenbachia, fern, ivy and poinsettia as well as is accented by pinecones, baubles, and ribbon. This holiday display is then arranged and delivered in a wicker basket with a handle. Time for Holiday Bargain Shopping!